Catsan Hygiene Cat Litter, is a unique product that combines ultra absorbent pellets of fine chalk and natural quartz to soak up fluids quickly, helping to minimise strong odours existing in the air for periods of time, and acting to inhibit bacteria formation. Catsan Hygiene offers extra mineral protection to increase overall sanitation of the area and be more hygienic for your pet. 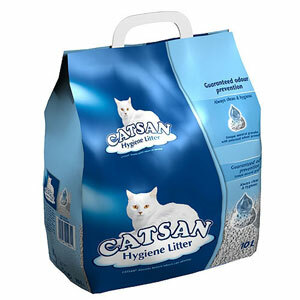 Fill the litter tray with CATSAN® Hygiene Litter to a depth of approximately 5cm. Remove solid waste daily and occasionally shake the litter box to mix the granules. Completely empty the litter tray at least once a week and clean with near boiling water and a gentle household detergent. The litter tray should be completely dry before refilling with CATSAN® Hygiene Litter. There are currently no questions for Catsan Hygiene Cat Litter - be the first to ask one!